✅Merkur # 23001 – Long-Handle Double-Edge Safety Razor has an easy to use long handle for extra grip and control for those of you with larger hands. + 10 double edge razor blades. All natural OSMA BLOC calms razor burn and limits irritations and bumps. ✅ALUM BLOCK – Natural mineral salts mined from centuries old Asian mines. It is 100% free of perfumes and chemicals, non-sticky, invisible and hypoallergenic. used after shaving. Alum will quickly sooth any irritation. Helps fight razor burn. Improves skin tone and prevents acne while killing germs and stops minor cuts and bleeding! Tired of cutting yourself so much that you look like you got attacked by a mongoose while you were shaving? Yeah. Us too. That’s why we made this shave set. The skin on my neck got especially sensitive while shaving – it would irritate me all day until it got so bad I finally couldn’t stand it anymore. I said “goodbye” to cheap razors and never looked back. You see, much like painting, shaving is mostly prep work. Except instead of taping off your dining room crown moulding so you don’t splatter it with that ugly Toasted Almond paint, you’re getting your hairs just right to be cut so you don’t splatter your cheeks with your own blood. Quit jamming a disposable razor on your face, hoping for the best with your fingers crossed behind your back… take matters into your own hands, literally. Once you feel the weight of the authentic badger brush in one hand and the stainless safety razor in the other, you’ll realize what you’ve been missing. Our scented shaving soaps lather so beautifully, you’ll hang your head with shame as you recall how you used to get shaving cream out of those aerosolized cans. By the way, we have all different kinds of scented shaving soap for men, so you’re sure to find one you love. The pre-shave oil makes the razor glide over your face like a gold-medal Olympic athlete competing in the Super-G slalom after a fresh fall of downy-white snow. The 10-pack of super sharp, premium razors are sure to keep you looking your best for a while, you handsome devil. Now you can use the aftershave to calm any skin irritation and inhale your new musk. Hang up the brush, single blade razor, and stainless shaving bowl on the razor stand and feel yourself swell with pride. You did it – you’re finally a man. Our wet shave kits make a great gift for Father’s Day, Christmas, birthdays, or if you just feel like quitting on the cheap disposable razors that aren’t working anyways. Put down the kiddie stuff and man up. ✅ Shaving Is Sacred | Take your time shaving – do you think your grandpa rushed out the door after mauling his face with a cheap disposable razor? Nope. ✅ Everything You Need | Other shave kits for men come close to getting you everything you need for the perfect shave, but we do it right with this complete package. ✅ Ultimate Refinement | We pulled out all the stops with this travel shaving kit: an authentic badger shave brush, high-quality dopp bag stitching, and everything you need for your face to feel it’s best. ✅ Great Gift | Our wet shave kits make the best gift for Father’s Day, Christmas, or that special guy’s birthday. Make him feel like a million bucks with this complete package. ✅ No-Risk Purchase | We wouldn’t feel right keeping your money if you were unhappy with our men’s shaving kit. That’s why we make returns easy, painless, and quick with our 30-day policy. Classic vintage old school traditional shaving set with 5 blade reusable blades. We combine our #1 selling 3 pc mug and badger brush set with our ergonomic sleek duion compatible razor for the ultimate wet shaving experience. Durable This set is great for home or on the road. Everything is extremely well made and we stand by our products 100%. 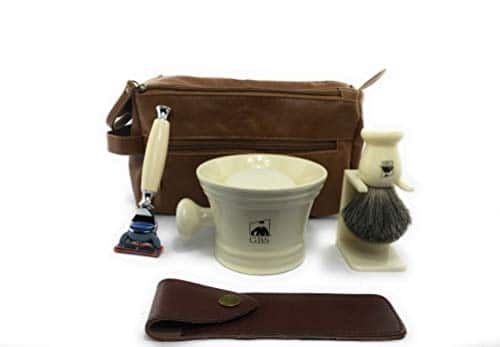 Quality – You cannot go wrong with this old school Wet Shaving Classic Kit. With proper care this set should last for years to come Remember in the first 30 to 60 days it’s common to lose anywhere between 25 and 50 bristles from the brush. This is normal and our brush is extra dense so you will not need to worry. GBS manufactures high-end grooming tools and accessories. We proudly off high quality craftsmanship and exquisite style at an affordable price. Are you sick of rummaging through luggage piecing together all your toiletries? Do you want a multi-function organizer that adjusts to your travel needs? Keep calm, cool and cosmetically collected with this bathroom bag from IQTRAVELS! Are you a globetrotter or know someone bitten by the travel bug? Whether you travel for business or go adventure when the opportunity arises, this organizer bag has something for everyone! Easily fit into other luggage or use the handle to lightly carry along. We’ve engineered this bag from Canvas fiber for maximum durability and tear resistance! Protect the contents of your bag from surface spills and wet spots with an outer waterproof layer. If you order now, you’ll receive a FREE multi-use laundry bag! Click ADD TO CART and order TODAY to take full advantage of our Limited Time SPECIAL BONUS! ✅VERSATILE FUNCTIONALITY – Pack everything you need whether you’re out for the day or away on a trip! This multi-use travel organizer is perfect for cosmetic toiletries, personal hygiene or makeup kits. ✅TRIPLE COMPARTMENT BAG – easily store and organize all your essentials. Three individual compartments and a convenient carrying handle. ✅BETTER DESIGN – TOTALLY MULTIFUNCTIONAL – We designed this toiletry organizer to be used in many different ways: as a men’s shaving kit, shave bag, and dopp bag. ✅USEFUL GIFT GIVING – This durable, waterproof bag makes a great gift for camping & college, as well as for business trips, leisure travel & car preparedness. Includes FREE drawstring laundry bag! ✅LIFETIME WARRANTY GUARANTEE – We just know you’ll love the versatility & superior storage capacity you get from your IQTRAVELS bag. And our risk-free Lifetime Replacement Warranty covers any damages! All-in-One SHAVING KIT – this shaving kit is your one stop station for the all inclusive shave set! 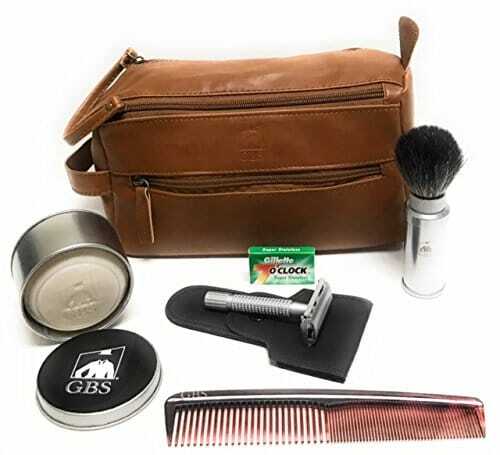 INCLUDED: Safety Razor with 10 blades | Shaving Badger Hair Brush | Sandalwood Shaving Soap | Shaving Stand | Stainless Steel Bowl | Canvas Dopp Kit. PERFECT GIFT – can it be better than this? this complete wet shave kit is the best gift that any man can ever get! Husband, father, colleague or friend….you name it! TOP NOTCH QUALITY – quality goes a long way. Each of our products has been crafted to deliver the finest shave at prices that will not break the bank. On top of this, quality shave products last much longer as than what you are used to. The days of 2 use shave cartridges and foams that only last for a month are over! NOURISH YOUR SKIN – our shaving soap is packed with natural high end ingredients such as: Shea butter, Aloe vera, Lavender & Coconut oil. 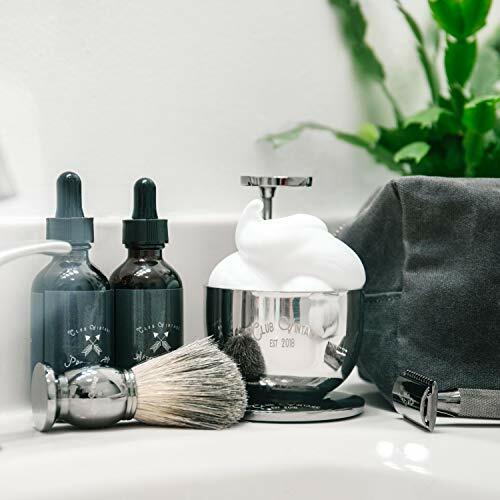 Using the Stainless steel shaving Bowl and Badger hair shaving brush – producing thick nice cream lather for your perfect shave becomes an easy task! 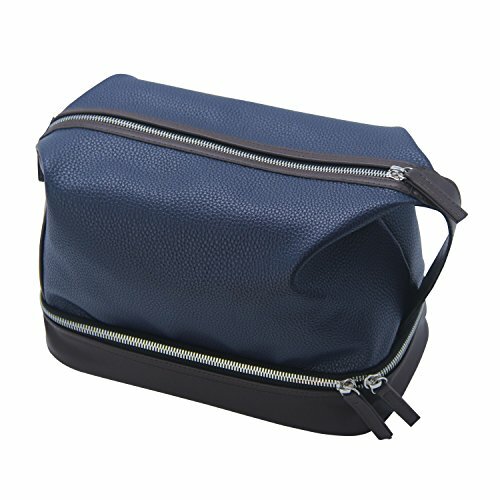 EASY TO TRAVEL & STORAGE – included is a canvas Dopp Kit carry bag, which can perfectly fit the entire shaving set inside. 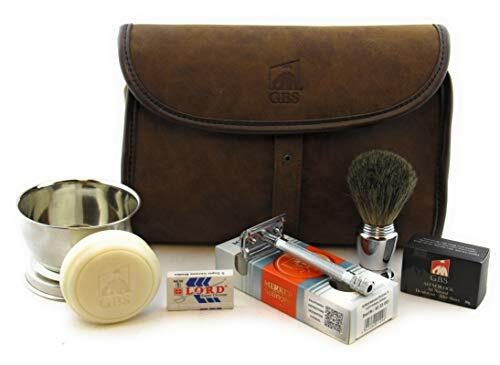 Shaving Kit for Men Wet Shave – Safety Razor with 10 blades, Shaving Badger Hair Brush, Sandalwood Shaving Soap Cream, Shaving Stand, Stainless Steel Bowl Mug, Canvas Dopp Kit – Gift Set All-in-One SHAVING KIT – this shaving kit is your one stop station for the all inclusive shave set! 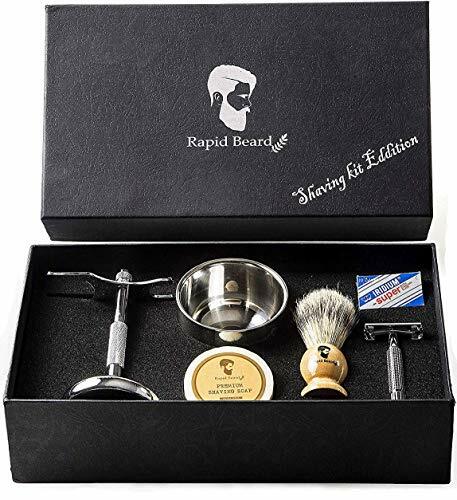 INCLUDED: Safety Razor with 10 blades | Shaving Badger Hair Brush | Sandalwood Shaving Soap | Shaving Stand | Stainless Steel Bowl | Canvas Dopp Kit. PERFECT GIFT – can it be better than this? this complete wet shave kit is the best gift that any man can ever get! Husband, father, colleague or friend….you name it! TOP NOTCH QUALITY – quality goes a long way. Each of our products have been curated to deliver the finest shave at prices that will not break the bank. On top of this, quality shave products last much longer as than what you are used to. The days of 2 use shave cartridges and foams that only last for a month are over! NOURISH YOUR SKIN – our shaving soap is packed with natural high end ingredients such as: Shea butter, Aloe vera, Lavender & Coconut oil. Using the Stainless steel shaving Bowl and Badger hair shaving brush – producing thick nice cream lather for your perfect shave becomes an easy task! EASY TO TRAVEL OR STORAGE – included is a canvas Dopp Kit carry bag, which can perfectly fit the entire shaving set inside. Plenty compartment for different use. 2 zippered compartments outside and inside has a zippered pocket and other two open pockets. Simple yet highly functional, for your essentials but is still compact enough to fit in any bag or suitcase. Giving you space for things like soap, shampoo, body lotion, toothbrush, toothpaste, facial cleanser, cosmetic, skincare cream, electric shavers, all toiletry essentials. Made of high quality grain PU leather. Fully polyester lining. 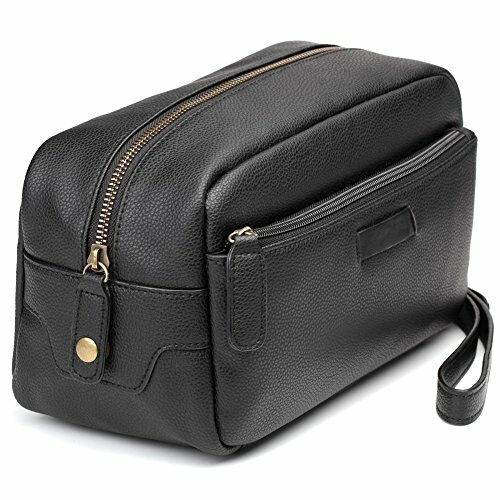 Main compartment can hold big toiletries like shaver, toothpaste, facial cleanser, etc.. 1 exterior zipped pocket and 3 inner pockets for other small toiletries. GBS manufactures high-end grooming tools and accessories. We proudly offer high quality craftsmanship and exquisite style at an affordable price. Travel Brush – Easy Assemble with 3 Pieces. 100% pure badger bristles. Great for any shaving enthusiast who travel! 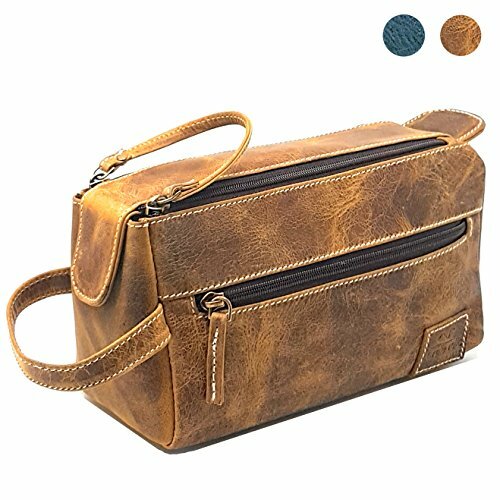 Doppler Toiletry Bag – 10″(L) 5″ (W) 5″ (H) a light cognac color. 1 Large compartment with inner and outer zippers Handle keeps bag hanging for easy access or just easy to carry. Metal Snap keeps bag closed tight. 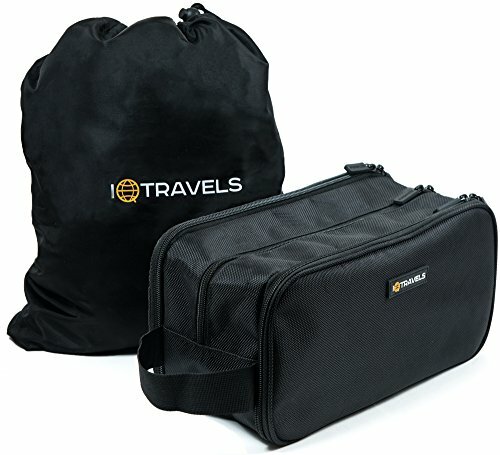 Keep all your personal traveling needs in one bag! Best side-kick for travel, business trips, outdoors activities, car, boat and at home bathroom or closet. All your personal needs in one bag! Butterfly Razor with Razor Case & 5 pk of Blades – Matte Handle. Sturdy safety razor has a Twist-to-Open (Butterfly Open” design for easy blade replacement. Textured handle makes a great grip for wet hands. If you want a close shave and fewer cuts this is the razor for you! Provides fewer nicks and ingrown hairs. Designed to make your shaving experience easier. CASE & 5 DE razor blades (randomly selected) included. Our toiletry bag has been designed to keep you traveling in style at all times. The minimalistic black design is perfect for both men and women and slots in easily with your luggage. Made from tough, highly resilient materials, this travel organizer will last you decades! Unlike the traditional toiletry bag that has just one compartment, we go two steps better! We improved the classic design by using use 3 different compartments so you can effortlessly keep your things organized. You’ll never have to rummage around, waste time or mix up your essentials again! Why not pick up one for a friend too? A travel bag is not only a great gift idea, it’s pretty universal too because, let’s face it, we all need one at some point – whether you’re traveling to some far-away vacation spot or just spending a few nights in a hotel or Airbnb, a nice quality, compact toiletry bag is a must-have! Not only that, our organizer comes with a large bonus waterproof bag to help keep everything dry (making it a great present for any holiday or occasion) and, at no extra cost, we include two best-selling E-books: Hack your Way to Better Travel and RV LIVING – The Ultimate Beginners Guide to Fulltime RV Life. All our products are Prime Eligible and fulfilled by Amazon because we leave the logistics and delivery to the pros! And of course, we back up our products with a no-questions-asked 90 day return policy. So if you have anything less than a great experience, you get 100% of your money back or a totally free replacement – no questions asked! So with nothing to lose, click ‘add to cart now’ and get yourself one of the best travel toiletry bags around! BETTER STORAGE – NO MORE RUMMAGING! 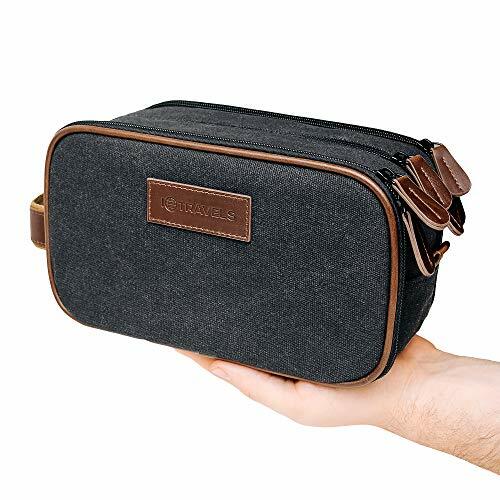 As any seasoned traveler knows, a good dopp bag needs multiple compartments to make sure small things like nail clippers and razors don’t get lost. Our hanging travel toiletries bag has 3 COMPARTMENTS to easily store away all your essentials – without them getting mixed up. And, as a BONUS, we also throw in an extra-large, yet compact, waterproof bag to make sure everything stays dry at all times! BETTER DESIGN – TOTALLY MULTIFUNCTIONAL: We designed this toiletries organizer to be used in all kinds of different ways: it can be used as a toiletry wash bag, travel storage organizer, portable travel kit organizer, shaving kit bag, shaving dopp kit and much more. Plus, it has a handy loop on it so you can hang it up when not it use. FASTER, SAFER DELIVERY: All our products are Prime Eligible and fulfilled by Amazon. We know how important it is to get your tsa approved toiletry bag delivered as fast as possible – and that’s why we leave it to the most trusted professionals. The second you place your order, it will be picked, packed and sent to you in lightning fast time by the logistics wizards at Amazon! A BETTER SHAVE KIT BAG OR YOUR MONEY BACK – At IQTravels, we back up all our products with our 100% no-worry money back guarantee. If for any reason you less than happy with your wash bag, just return it to us within 90 days and you get your money back or totally free replacement – no questions asked. This beautiful vintage storage box serves several purposes. It comes in handy for organizing travel supplies like toiletries, makeup, cosmetics, underwear, medicines, etc. It can also be used as a storage box for stationery or art and craft supplies. Handcrafted from genuine hunter leather, it’s an ideal gift for your loved ones which they are sure to treasure as a keepsake. Sandalwood Shave Soap w/ Shea Butter Argan Oil & Aloe for Wet Shaving Straight Razors, Double Edge Safety or Disposable Razors. 4oz Shave Puck. Handmade in USA. 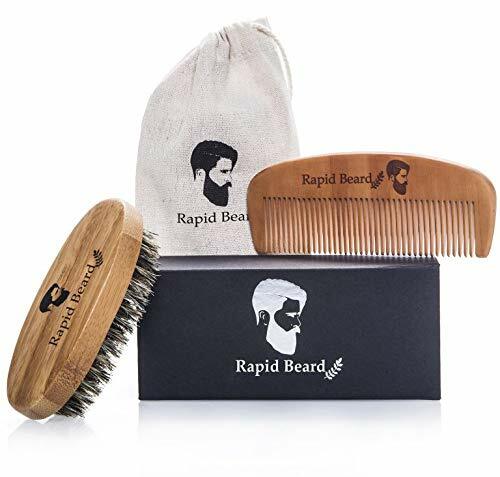 Gifts for Men – Use in Dopp kits! Not all shaving products are created equally! Wet Shaving is and art and using quality products makes the experience a pleasure and provides the best results. 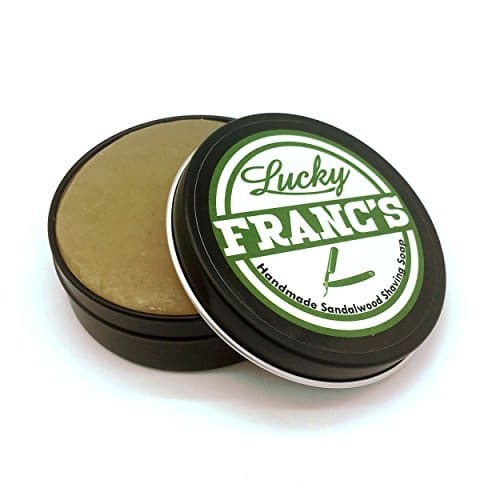 This Lucky Franc’s Brand glycerin based shave soap is handmade in the USA. You’ll love the classic scent and the large 4oz size will last for many wet shaves. Comes packaged in a handy black tin that allows you to store your shave soap when traveling. This is a great addition to your shave kit. Infused with Argan Oil, She Butter, Aloe, Chamomile, and Kaolin to provide a smooth glide and reduce razor burn and irritation. Directions: Place shaving soap in your favorite shave bowl or shaving mug. Use warm water and a shaving brush to whip up a rich lather. Apply lather to you face using upward motions to lift facial hair with your brush. Use a double edge safety razor, straight razor, disposable, or dollar club style razor to shave. Reapply if you wish to make a second pass with your razor. Rinse with cold water and apply after shave gel, lotion, splash, or tonic. Makes a great gift for men! Handmade in small batches in the USA. Never tested on animals, 100% Satisfaction Guaranteed! If you’re not happy, we’ll make it right. Classic Sandalwood Glycerin Shave Soap. Amazing scent! Wet shaving is an art! Use the best hand crafted products for the closest shave and feel like you just came form the barber shop. Smooth Shaves for Days! Use your favorite shave brush and shaving mug or shaving bowl to whip up a great slick lather for your next shave! Add this classic shaving puck to your shaving set or travel kit! Infused with Argan Oil, She Butter, Aloe, Chamomile, and Kaolin for smooth glide with less razor burn & bumps. Comes in a handy tin that can be used to store your soap when traveling. Add to your dopp kit! Use with straight razors, double edge razors, safety razors, or your favorite disposable or shave club type razor for a smooth glide and close shave everytime. Makes a great gift for men. Perfect man’s gift for Father’s Day, Birthday, or Holidays. Easy to gift wrap and a gift a man will love. Posted in Wet Shave | Tagged Aloe, Argan, Butter, Disposable, Dopp, Double, Edge, Gifts, Handmade, Kits, Puck, Razors, Safety, Sandalwood, Shave, Shaving, Shea, Soap, Straight, USA.